Revolutionary E-book and follow-up training for the contemporary worship ministry. Gives a firm theological foundation for worship leaders and worship musicians. The Invisible Worship Musician is an e-book that provides insider teachings on leading your church to produce the ultimate praise music. Topics like spiritual dynamics, “worshiping God versus worship music,” and scriptural references to dance, music, and instruments, The Invisible Worship Musician is a complete guide to worship ministry in today’s church. “The Invisible Worship Musician” is the result of Junjie’s 14 plus years in the worship ministry. As a serious student of worship, Junjie has analyzed pastors, worship leaders and worship musicians who effectively lead people into worship. And those who didn’t. His broad range of experience in many situations helped him find out WHAT WORKS and, more importantly, what duplicates. In other words, the specific things that YOU can depend on to work for YOU when you minister in worship as a worship leader or musician. All that carefully compiled for YOU in a 170-page e-book. Junjie carefully explains and lays bare not only the techniques that have been successfully used to lead and play for worship, but also the theology behind the techniques, so that you can understand how the Word of God speaks to us about the worship ministry. I recommend that you read this book and think carefully about all that Junjie has written. There are thoughts in here that are valuable to all of us in who serve in this area. 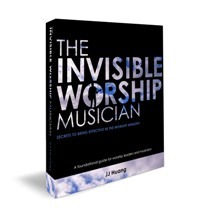 Buy this resource – Read it carefully – Study it – and Put it to work in your OWN church Get the Invisible Worship Musician Today, and begin to really serve effectively in the worship ministry!